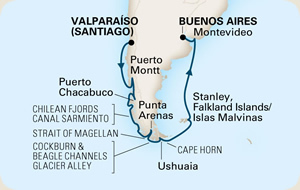 Santiago is the official capital of Chile with the cruise port actually located in the City of Valparaiso, a vibrant center of Chilean culture. Before traveling to Santiago, plan on spending some time in this beautiful resort town with cable cars, tiered city plans and the magnificent sea views. Enjoy an excellent three course meal at one of the many restaurants. While at sea you can enjoy the vast amenities offered aboard the cruise ship. Craft Cruises holds various classes during times at sea. Here in the heart of the Chilean archipelago, discover stunning scenery: dense rain forests, bright-blue lakes and snow-covered mountain peaks. Fjords more spectacular than those in Norway or Alaska? See them here along the southern coastline of Chile . . .a 1,000-mile maze of virgin-forested islands, glistening glaciers and more fjords than in all of Scandinavia. Be among the lucky few to spend a glorious day scenic cruising through Tierra del Fuego and the snow-capped peaks and ethereal blue glaciers of Canal Sarmiento. Cutting through Chile's Torres del Paine National Park, this majestic waterway is surrounded by other-worldly beauty. Enjoy breakfast or lunch on your private verandah and watch as Amalia Glacier comes into view and witness countless seabirds that make their home in this dramatic landscape. Punta Arenas is another beautiful, colorful city and the gateway to Chilean Patagonia. The dividing line between Antarctica to the south and Patagonia to the north, Punta Arenas is the capital of Chile's wool industry and first became a thriving city during the California gold rush when it served as a port for clipper ships. Perhaps one of the most dazzling places on earth, Chilean Patagonia boasts many islands, mountains, glaciers and icebergs in a truly beautiful arrangement. Stanley is the only true town in the Falkland Islands and is also one of the most remote and smallest capitals in the world. The islands are windswept, treeless and boggy, which lends itself to a perfect setting for the many colonies of Penguins, including Gentoo, King and Magellenic penguins. Because the winds and seas around Port Stanley are so fierce, about only half of the cruise ships scheduled to stop actually make it. With the rough seas hampering even the navigation of the tenders, it's not surprising that the harbor and surrounding areas have more shipwrecks than any other harbor in the world. When the tide is out, you can see up to 20 hulls of shipwrecks from the 19th century shipping trade. Montevideo, Uruquay is a friendly and refined city, less cosmopolitan than many of the other cities in Argentina and Brazil while still offering plenty of sightseeing possibilities. As Uruguay's major business center, Montevideo still practices colonial customs including siestas, long lunches and high tea. Buenos Aires conjures up an image of sophistication, romance, friendly people, Latin sizzle, fabulous meals and robust Argentine wine. Commonly referred to as "The Paris of South America", Buenos Aires is to many, much more appealing and affordable than many other world-class cities.